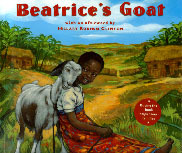 "Beatrice's Goat" - a true story about an nine-year old Uganda girl and a goat named Mugisa that was donated to her family that changed their lives. From the Afterword by Hillary Rodham Clinton: "Several years ago, Heifer International ... invited Page McBrier and Lori Hohstoeter to East Africa to research a children's picture book. 'Beatrice's Goat,' a true story about a nine-year old Ugandan girl, is the result of that trip. It is a heartwarming reminder that families wherever they live, can change their lives for the better. To do it, they need three things: resources, training, and community support. Through Heifer, Beatrice's family received all three. They received a goat that provided nutrition and income, knowledge of how to care for this precious gift without harming the environment, and a supportive communtiy that looks forward to sharing the benefits as Mugisa's offspring multiply and are given to an ever-widening circle of families."